Patrik Lindström Industrial Swedish Thirteenth Exile got signed to the Memento Materia sub label Prototyp back in 2005 and released his debut album 'Assorted Chaos and Broken Machinery'. With Memento Materia being quite inactive the last few years and Prototyp as well, I'm glad to see that they are somewhat back with a new release. Thirteenth Exile has not released anything since 2005 until now, so with 6 years in the making, you kind of expect a masterpiece. 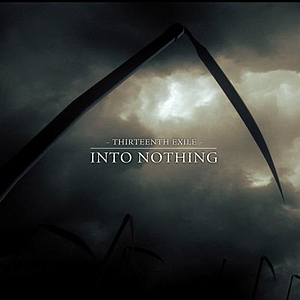 Even though we will perhaps remember 'Into Nothing' as a masterpiece, it's a well-produced electronically touched industrial album. The earth breaking guitar riffs gives quite the late 90's feeling all over it, but with the modern touch. It's sometimes slow going, but always gritty and gray. It's something that comes out at you from the fog with red eyes and a drooling smile. You should probably fear it. If you are brave enough to take a closer look, you'll find that behind all the industrial grittiness, there's something well produced and pensive about it. Furthermore, I'm glad that this album is not a mindless basher from start to end. I enjoy everything from the faster paced "The Worm" the album starts with as much as I like the emotional ballad "A Perfect World" in the middle of the album. The diversity is needed to keep me interested and that is exactly what Henrik Svegsjo manages to do with his 'Into Nothing'. For once, the cover art actually manages to catch the atmosphere and setting of the album itself. Swedish Thirteenth Exile got signed to the Memento Materia sub label Prototyp back in 2005 and released his debut album 'Assorted Chaos and Broken Machinery'. With Memento Materia being quite inactive the last few years and Prototyp as well, I'm glad to see that they are somewhat back with a new release. Thirteenth Exile has not released anything since 2005 until now, so with 6 years in the making, you kind of expect a masterpiece. Even though we will perhaps remember 'Into Nothing' as a masterpiece, it's a well-produced electronically touched industrial album. I hope that Thirteenth Exile can stand in the forefront of a comeback from Memento Materia and Prototype, I've missed them. Here's also evidence of how an artist can evolve during the years and create something well worth your attention, because 'Into Nothing' is just that, worth your attention.